Jennifer Aube, Founder of Do You Bake? And Crave It, found at www.doyoubake.com and www.justcraveit.com, has featured in Women’s Health March Magazine Issue, Runners World, Prevention Online, Redbook Magazine’s Dec/January 2017 issue and others. She is the foremost authority on WHY losing weight slowly is hugely beneficial. 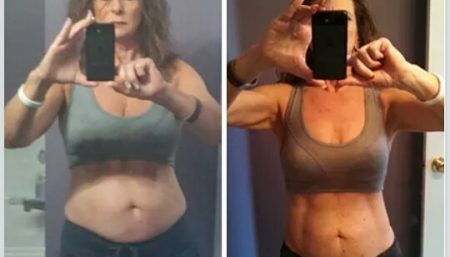 She once used to be 245 pounds and lost over 120 pounds and was featured for her weight loss in Prevention Online, Women’s Health, Runners World and others. It took her over 2 years to lose the weight and has maintained her current weight for over 2 years now. To know her complete story, Women Fitness thought of catching up with Jennifer Aube. I was in my mid to late twenties and maybe it’s that cliche ‘I woke up one day and made a decision to make changes’ but that’s how it really began. I am a busy person and have always been that way. A type personality and love the thrill of the build. However, the professional successes didn’t make up for my personal discomfort. I couldn’t keep up with my clients, I felt tired when walking my dogs, I felt sluggish, I couldn’t fit into the already very large clothing I had, and started to realize that my lifestyle was unhealthy and unfulfilling. And so..I started with small changes. Food first (Bringing real food back home and focusing on cooking and baking solutions from home). Fitness second. It for the most part has been great. I have to remind myself to be kind to myself and celebrate what I have accomplished. I have lost over 100 pounds, I am a very small version of my former self and I continue to progress year over year. The weight loss was easy in that I didn’t focus on the day to day. The post weight loss has been more difficult. This is really where I have learned HOW to eat and HOW to work out. I have learned a lot more about fitness and nutrition. About fueling the body properly and about lifting heavy weights. I wish I had known that at the beginning. Most won’t tell you all the facets to living well and achieving balance. We focus too much on the scale, on calorie constriction and on excess cardio. I did too. My weight loss journey included a lot of those things. I spent the entire year last year repairing my metabolism and putting up the scale. The scale, is your enemy and its hard for me even today to continue to realize that. This year, I eat 30% more than last year and I am now in transition, learning how to build more muscle and stoking my metabolism. I now weigh myself weekly to understand more about how my body behaves. My size gets smaller, the scale actually has increased. This is a serious mind shift for anyone that focuses on weight loss. It’s hard to understand that weighing more can mean and does mean healthier if you approach it properly and muscle takes up less room, pound for pound, than fat. My hardest component is the mental shift and the excess skin. By body is not bikini perfect. However it continues to progress through time and if you look year over year or several months apart, you see major body shape differences. Understanding the time, learning patience can be difficult when you live in a ‘i want it yesterday’ society. I have learned to stop looking and comparing myself to others. I have educated myself on all facets of fitness and food and nutrition and I lean on those for expert opinions who not only have been there, done that but also are naturally built (no drugs, no fat burners. Just good honest hard work and effort). I take one full day of rest a week and two days off of cardio. I eat five to six times a day. Everything homemade. Balanced for how my body behaves. I lead with protein, then carbohydrates and then a little fat. I eat vegetables at three (at least) meals. My highest carb meals are before and after a workout. I indulge once or twice a week based on what I want. I tried to approach a ‘cheat meal’ system but that doesn’t work well for me mentally and so I instead use emotion and feeling to lead my way and self love. If I want a cookie or a slice of cake or a hamburger, then I make it from home and enjoy it. I love to cook and enjoy many international cuisines and so that’s when I indulge and enjoy something that’s not quite as nutritionally balanced as I’m used to throughout the week. I do add in protein shakes as they are quick and easy and the protein is 100% natural. I take a multi vitamin, CLA, omegas, Vitamin D and B. Me. I was my motivation. My challenge. The will I put into what I did was for me. It still is to this day. If you can’t do it for yourself, then don’t do it. It’s not about vanity for me. It’s about LOVING what I”m doing and enjoying it and seeing how far I can go naturally. And now…trying to lead an example and show others what is real and not. My boyfriend has also lost over 100 pounds. We share common goals. I have been with him for almost a year and we workout together about 80 percent of the time. It is easy when you are with someone that loves the same things as you. He loves to eat everything I cook and he is also a certified personal trainer and extremely knowledgeable about all things fitness and nutrition. Having a partner that celebrates wellness like you, helps tremendously. Support systems matter. That and I really don’t ever imagine myself going the other way again. I just truthfully have figured out how to live well and enjoy food and fitness and life all at the same time. I have learned that balance. It’s not a crash diet or a fad or some wacky constriction of food. It’s truly learning balance and loving every bit of it.